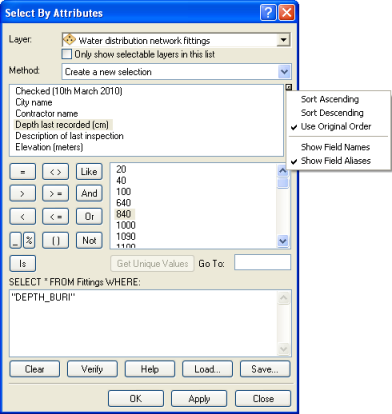 One of the selection methods you can use to select features in a layer is to select features using an attribute query. This is performed using the Select By Attributes tool, which is described here. 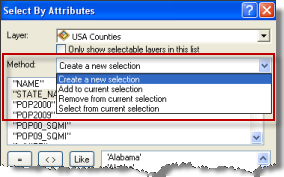 Select By Attributes allows you to provide a SQL query expression that is used to select features that match the selection criteria. Click Selection > Select By Attributes to open the Select By Attributes dialog box. Choose the layer to perform the selection against. Create a query using the expression building tools. 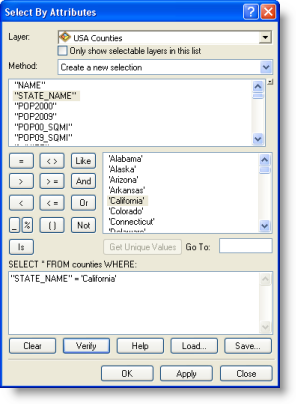 Type a query into the selection window. Load a query saved to disk. See Building a query expression for information on the syntax of a query. Click Unique Values to see the values for the selected field when creating a query expression. You can type a value in the Go To input box to quickly navigate this list. Validate your query expression by clicking Verify. Click OK or Apply to execute your selection expression and work with the selection results. Optionally, you can save your query expression for later reuse before closing this dialog box. A button on the right side of the Select By Attributes dialog box lets you choose how fields will be listed. Viewing field aliases in the list can be helpful, because they can make cryptic field names more understandable and long ArcSDE field names more manageable. Choosing to show aliases on this dialog box will not affect the expression syntax. Field aliases will not be shown or supported in the expression itself. If you double-click a field alias, it will still be added into the expression with its actual field name and any required [ ] field delimiters. In the example shown below, the field list shows the alias Depth last recorded (cm), which has been added into the expression as the field name DEPTH_BURI. Other options on this menu allow you to choose how the fields are sorted in the list. By default, the fields are still listed in their order in the data source. Choosing Sort Ascending or Sort Descending can make it easier to quickly locate the field you want.